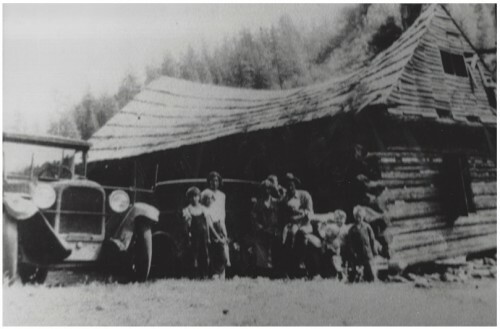 Members of two pioneer families at the Routledge cabin in the mountains: Ethel, Herbert and Ann Routledge, Stuart Fenton, Alice and Mac Fenton, Elmer Routledge, Jessie, Bob and Charlie Fenton. Welcome to the Jemez Valley History Project, a free public service brought to you by the Jemez Springs Public Library. With community involvement, we are building a digital archive of historical information about the Jemez Valley and surrounding areas to include known human history as well as the unique geology and natural mineral hot springs. The geographical scope of this history archive is roughly the southwestern part of the Jemez Mountains: bounded on the north by Fenton Lake, Seven Springs and Hwy. 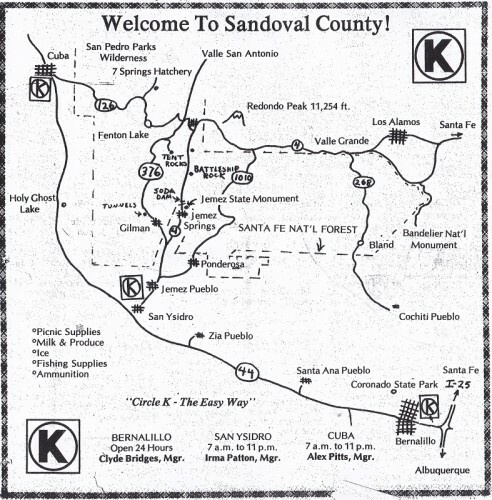 126; on the east by the Valles Caldera; on the south by the Village of San Ysidro; on the west by the Nacimiento Mountains and the Village of Cuba. While Los Alamos and the Pajarito Plateau are important in the area’s history, that part of the Jemez is well-served by a Los Alamos website. 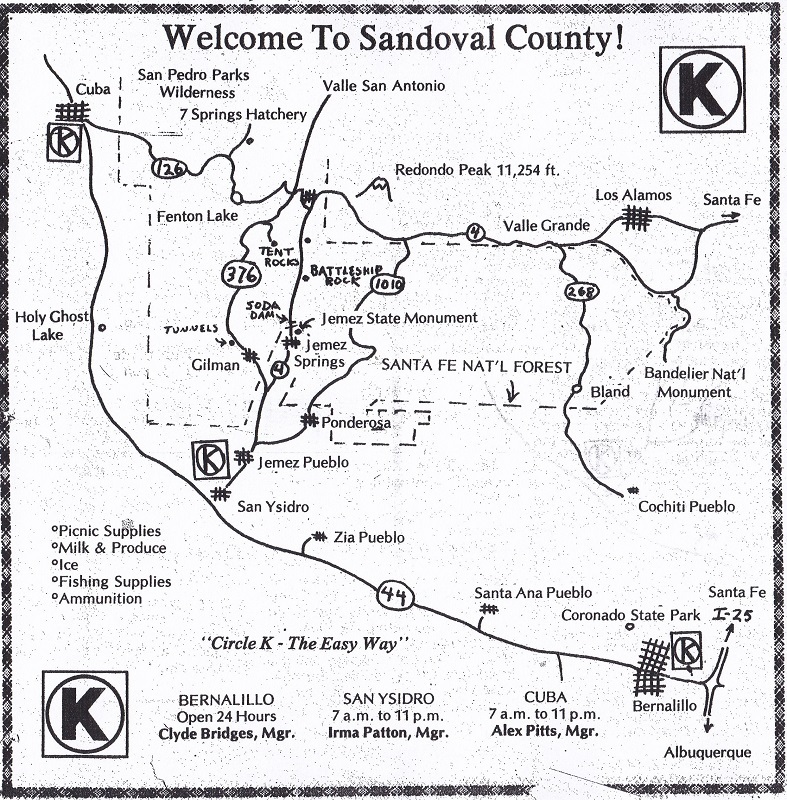 This map in a Circle K ad from the Sandoval County Review, September 4, 1978, illustrates roughly the area covered in this history. This is a living archive. Information will be added continually by our volunteer cadre of writers and researchers, as well as members of the public who wish to share anecdotes, memories and images. Volunteers conduct interviews, contribute their stories and images, and suggest leads for additional research. Please browse around using the menus, categories and search options. If you have something factual to add to a historical post, please leave a comment. If you wish to add stories or information related to a page, you will find comment boxes at the bottom of each page. All comments are reviewed and, if verifiable, will appear under that post. Your ideas and comments are welcome! Thank you for your interest and support of this exciting project. The Jemez Valley History project was started in 2015 and funded in part by the Friends of the Library. Content is written and edited by Judith Isaacs, volunteer, and Amanda Lewis, library assistant. Janet Phillips, Library Director is the overall coordinator. For further information: judith@jemezvalleyhistory.org.